Families across the country are knee deep in figuring out the best way to pay for college for their now-seniors, and the GI Bill is part of many of those conversations. Being able to transfer the Post 9/11 GI Bill to a kid is a huge benefit. When you have more than one child (we have four! ), you want to do some thinking about how to use the GI Bill to get the maximum benefit for your family as a whole. Just splitting it up evenly between the kids doesn’t always make the most sense. In fact, it rarely does. Where is your child going to school? What is the child’s potential for merit aid, and what are the siblings’ potential for merit aid? How does your child’s school apply the aid they’ve earned? Do you have other college funds to use? Is your child eligible for other educational benefits? Do you expect the GI Bill to be different during a different year of college, or when a different child is in school? If you’ll have multiple kids in school at one time, your chances of need-based aid increase in those years. In this situation you may want to consider using the GI Bill in the years when there is just a single child in college. Then, you can take advantage of need-based aid during the years when you have more than one child in college. It makes more sense to use the GI Bill for more expensive schools, and for schools that participate in the Yellow Ribbon program. It also makes more sense to use the GI Bill for schools located in higher cost-of-living areas, because the housing allowance portion will be higher. For example, our first daughter started at the local community college. It would make no sense for us to use GI Bill benefits there. The tuition is inexpensive and the cost of living in our area is moderately high, but not as high as Boston or New York. This is where some guesswork comes into play. Is it likely that a subsequent child will go to a more expensive school than the first child? In most cases, we don’t know where a younger child will go to college when we’re making this decision, but we may have some inkling. Whether by luck, hard work, or random ability, some kids are going to receive merit aid than other kids. If you have one child that is more likely to receive significant merit aid, then you probably don’t want to save your GI Bill for that kid. Once again, there’s some guessing going on here. How money is applied to a college balance can depend on a wide variety of factors. In some situations, merit money is only available to be used for tuition. In that case, the amount paid by the GI Bill is reduced by the amount of the tuition-only aid. If you have one kid who has tuition only financial aid, and one kid that has financial aid that can be used for room and board, it is more beneficial to use the GI Bill for the child whose financial aid can be used for other thing. Depending on the nature of your other college funds and your overall financial picture, there may be some strategy to using other funds earlier or later. For example, depending on how the plan is held, distributions from a 529 plan may count as the student’s non-taxable income, and may impact their need-based aid. 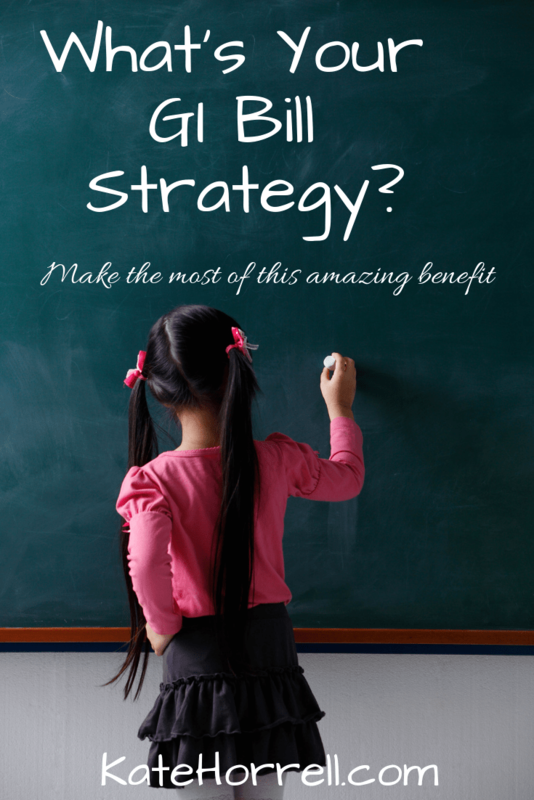 With some strategy, you can minimize the impact by using 529 money in a later school year. Depending on which college funds you have available, the strategy may be different. Is your child eligible for Department of Veterans Affairs (VA) Survivors’ and Dependents’ Educational Assistance (Chapter 35) benefits, Texas state Hazelwood benefits, or other benefits? This often requires coordination, as different programs have different requirements. Do a ton of research and ask a lot of questions! Do you anticipate having a change of income during the school years? Maybe you’re facing retirement, or your spouse is going to start working. How will this impact your ability to pay for college during different years. GI Bill benefits are constantly changing. I think there has been some change every single year since the Post 9/11 GI Bill was introduced in 2009. As the military looks at ways to reduce the cost of this unsustainable benefit, changes that reduce benefits are almost inevitable. So far, there have been suggestions to eliminate or reduce the housing allowance portion for transferred benefits. So far, none of the big changes have stuck, but you may feel it smarter to use the benefits now and not worry about future changes. Despite having two kids in college, a high school senior, and a high school junior, we still haven’t figured out how we’re using the GI Bill. Kid 1 is still at the community college, but we may use the GI Bill when she transfers to a four-year school because she missed out on all the freshman scholarship programs. Kid 2 is safely ensconced at a four year school that is inexpensive, and she has enough merit aid to keep the costs in our price range. Kid 3 and Kid 4 are both looking at a wide range of schools, including some very expensive ones, but both are also pretty competitive for merit scholarships. And we’ll have four kids in college for one year, so we hopefully will get some pretty significant need-based aid that year. One can hope. Maybe no one will need any of it and we can spend our retirement at cheese making school in Italy. As you can see, there’s no single best way to divvy up the GI Bill if you have multiple kids. Please don’t just say, “You each get two years,” without considering the variables that might make it more valuable used in a different way. Might as well make the most of that awesome benefit! Oh, that isn’t nearly complicated enough. Add in American Opportunity Credit-an awesom tax credit. Spend $4000 to pay tuition and books that isn’t paid from the 529 or GI Bill and if you have kept your AGI below $160,000 (starts to phase out MFJ, single is $80,000)- then get $2500 credit, $1000 of it refundable. And you can get it for each student. So now you juggle all 3- 529, GI bill, and “regular” funds (savings, current income or the not preferred student loans) to ensure that $4000 of tuition gets paid for each child in each calendar year from those “regular” fund sources. And if your income is above where the phase out starts, then make traditional TSP or 401k contributions to push down that AGI. And keep monitoring and juggling that all year every year while wondering how many bones you have to break before these kids will actually apply for some scholarships. Okay, no broken bones, but sometimes I wish our military would have just pressed them into service.